I'm conflicted by Truly Madly Deadly. On one hand it utterly surprised me and on the other hand it fell a little flat. So, I am trying to put my head in the space of a younger reader, the target audience, and write my review there.Truly Madly Deadly has all the ingredients to be one hell of a thrill ride. The cover and title alone are pretty fantastically creepy. Add a mysterious synopsis, like the one above, and I'm sold on wanting to read it.Sawyer's boyfriend has just passed in a drunk driving car accident but there is more to the story than that. Details emerge that Sawyer and Kevin didn't have the picture perfect relationship everyone thought they did and when Sawyer finds a cryptic note in her locker...she realizes her secrets aren't so secret after all.This starts a quick and frantic journey. People around Sawyer are dropping like flies and they are all people who hurt Sawyer in one way or another. Each time someone kicks it, Sawyer receives another note from her 'admirer'. There is a lot of fear and guilt at war in Sawyer's head but when she looks for help the stealthy stranger blocks her with some really severe warnings. Sawyer is pretty alone in the world, despite being surrounded by people who seem to genuinely care about her.Jayne does a fairly good job of keeping multiple suspects in play. At one time it could have been one of a handful of players, including Sawyer herself. She was the funnest choice for me to play with as it added well to the psycho-thriller aspects of Truly Madly Deadly. And, I'll admit...I didn't quite have the perp fingered by the end of the story. Always a plus.So, where did it fall flat for me? It was too quick, not quite creepy enough and at times felt a little frantic, but not in the way a scarey story should. I think if the pace has slowed down just a bit and a little more time and detail was given to the more macabre parts of Truly Madly Deadly, it would have been a home run. 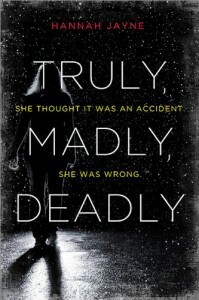 The scare factor just didn't have enough time to steep, for me.I think Truly Madly Deadly will have success with the YA crowd, as there really is not an abundance of this type of read out there in that genre. If you are looking for a short, fast paced thrill ride that won't scare the nightmares in to you, Truly Madly Deadly is a great choice.